Unlike wooden or bamboo bokken which may chip, dent and break over months of sparring use, these modern training swords are virtually unbreakable. Constructed with high grade polypropylene, they are designed for hard and prolonged use. With just the right combination of hardness, stiffness and flexibility, this bokken sword should last a lifetime with reasonable use. Ideal for one-on-one sparring sessions, practicing and perfecting your sword form, cosplay, role-playing and re-enactments, or use as a samurai sword display. This is our only synthetic bokken to feature a wrapped style handle, providing that real sword feel and the most secure grip possible. 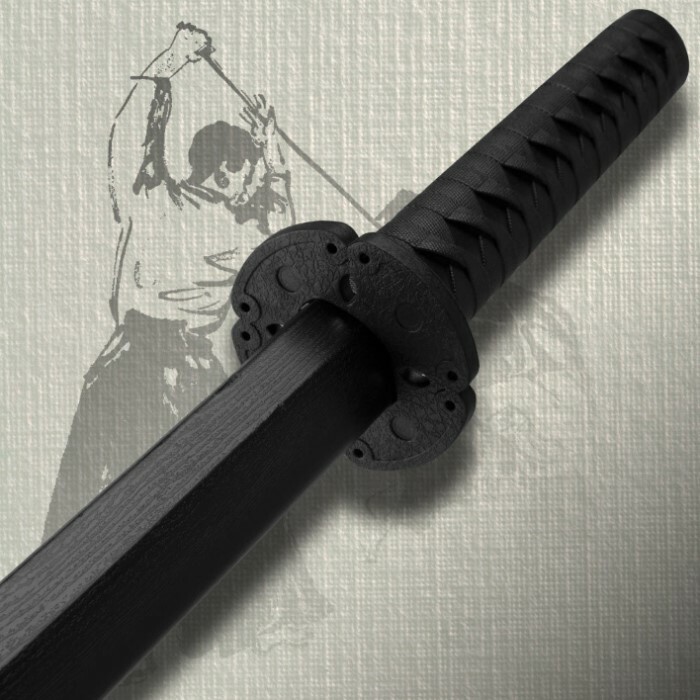 The entire sword is constructed of polypropylene, including the wrap-styled handle and guard. Measures 39 1/4 in. overall. Any time I train, this is my go-to blade. It has an astounding durability and a great weight to it as well. It's so good, I had to order another for my friend.. Very nice, it is very durable. It is about the same weight as an actual katana. 24cm hilt and a 74cm "blade." Very satisfied. This is a great bokken for starters. Although the sides are slightly uneven and it warps/vibrates around a little when you hit stuff with some force, it's a great bokken for starters and anyone that practices kendo or any other sword play. Excelent bokken... but I didnt like the way ny order was passed from ups to postal delivery... that was a whole big deal... i hope this wont becomme a common practice with trueswords... im used to getting my deliveries by ups on the appointed day and place i appointed to deliver place, having to go to the local post office and pick them up 2 days later?....Whats that all about?..... I've been a loyal cutomer of trueswords for a long time and this is the first time I've ever ran into anyting like this....But the bokken did arrrive and are excellent training tools.... don lr=et that happen again trueswords..... your not the e only place i can buy steel from. I have had this bokken for a couple weeks now and it has become the training weapon I use the most. It's weight and durability make it perfect for katas and for strike practice. I would recommend this to anyone who wants a great bokken for training. Great for the price, felt good in terms of balance, and had a nice overall feel to it. Being polypropylene, however, it has certain weak spots, and will snap cleanly in two with too much use. Mine lasted for seven months. 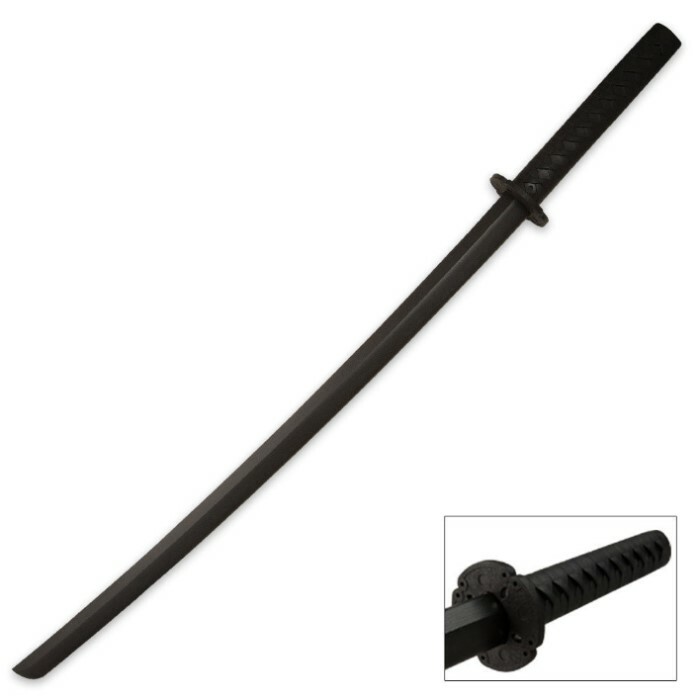 I prefer the Ichigo bankai bokken to this sword, as it is more durable, cheaper, and definitely more of a workout. However, I would certainly not turn any beginner away from this incredible find. Just got it in yesterday and it is an amazing product. It doesn't feel oddly balanced while holding it, and I can swing with relative ease. I highly recommend it for something you will use often. If you have the right equipment (some serious padding) you can spar with a pair of these. If not, then don't 'cuz this bugger hurts! Easily broke several branches larger than my arm, and this thing has not even a scratch on it. Only this is that it came a little bit bent to the side but its only noticeable if you're really lookin' for it. All in all a great product, though.